According to estimates by Ukraine’s Ministry of Energy, it is possible to export back to Ukraine up to 30 billion cubic meters per year from Slovakia. After Russian gas company Gazprom canceled the discounts previously given to Ukraine, the price of gas for Kyiv rose to $485 per 1,000 cubic meters. Ukrainian authorities are now hoping to obtain reverse deliveries from Europe by buying Russian gas that is being sent to European consumers. Gazprom is currently blocking such solutions. Germany's RWE Supply & Trading confirmed the plans to resume supplies of natural gas to Naftogaz Ukrainy via Poland on Tuesday. RWE also said that in 2013, the company supplied around 1 billion cubic meters of gas to Naftogaz Ukrainy. 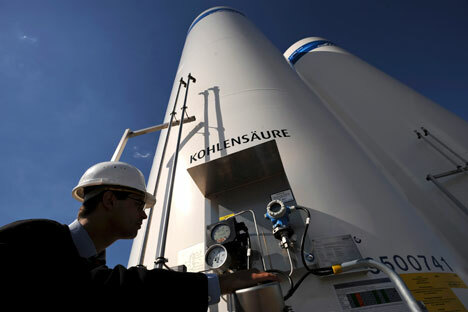 Ukraine began importing natural gas from Germany through Poland in November 2012. According to the Ukrainian Ministry of Energy, the country will need to import only 15 billion cubic meters of Russian gas in 2014 - the remaining 35 billion cubic meters will come from reverse deliveries from Europe. In fact, Viktor Yanukovych had already began work on this project before he fled the country: In 2012, Ukraine launched reverse gas deliveries under contract with German company RWE, imported from Poland, and in 2013 – from Hungary. However, the prices for this gas were quite high, approximately $390 per 1,000 cubicmeters, which was about $100 more expensive than the prices charged for gas by Russia, taking into account Ukraine’s discount. The contract between the Ukrainian company Naftogaz and RWE provided for additional monthly agreements that would determine the prices and volumes of supplies. Moreover, these prices were actually connected to prices on the European gas markets. As a result, the total amount of reverse supply amounted to 2 billion cubic meters of gas, with the maximum possible delivery coming to 6 billion cubic meters. Now however, due to the increased price for Russian gas, the situation has changed, and it is much more profitable to buy gas from Europe than from Gazprom. Thus, the Ukrainian authorities are hoping that Slovakia will save the situation for them – according to estimates by Ukraine’s Ministry of Energy, it is possible to export back to Ukraine up to 30 billion cubic meters per year from its western neighbor. Technically, reversed delivery is possible. “For this to occur, the country prepared to organize a reverse supply must have local excess gas. Due to the fact that Gazprom has concluded contracts under the ‘take or pay’ scheme, many countries may have such an excess,” said Ilya Balakirev, chief analyst at UFS IC. Under this scheme, the buyer must pay for delivery, no matter how much gas is purchased. As a result, the buyer ends up having an excess of gas – Slovakia is in this situation. However, the Slovak authorities do not have the technical capabilities to physically reverse the gas flow. Can energy, arms exporters demand payments in roubles? “In Slovakia, there are no additional pipelines that would allow the country to organize a reverse flow. The existing pipelines are filled with Russian gas, which is supplied under an agreement concluded a few years ago between Gazprom and the Slovak company Eustream,” says Dmitry Baranov, leading expert at MC Finam Management. In the end, it is quite possible that what is actually being proposed is a so-called “virtual reverse”. Ivan Kapitonov, Associate Professor at the Department of Government Regulation of Russian Presidential Academy of National Economy and Public Administration, told RIR that at gas measuring stations, certain volumes of gas could be shown to be being shipped to Europe, but in fact the gas pipeline would have earlier been filled, hiding the siphoning of gas off into a reverse flow pipeline via a ‘looped' pipe junction. “Thus, technically there is no reverse, but there is a siphoning off of gas by Ukraine from the Russian pipeline,” said the expert. Gazprom has the right not to pay for the transit of such gas, but since Ukraine does not want to lose this transit income, it calls this scheme “reverse delivery”. Reverse deliveries of gas to Ukraine from Slovakia were planned to begin in November 2013 at the initiative of President Viktor Yanukovych, but this decision was blocked by Gazprom. The position of the Russian company has not changed since then. In an interview with one of the largest Russian TV channels, Rossiya 24, in April 2014, the head of the gas holding, Alexei Miller, questioned the legality of reversing gas supplies to Ukraine. According to Ilya Balakirev, it would be more efficient for Gazprom to do away with the “take or pay” formula and offer discounts to the Slovaks – this would make reverse deliveries uneconomical. Eustream has already released a statement making it clear that the reverse supply of gas to Ukraine is impossible without Gazprom’s consent. The same point of view was voiced in an interview given to the Ukrainian newspaper Delo by the Slovak Deputy Prime Minister and Minister of Foreign Affairs, Miroslav Lajčák. A Eustream representative also told Reuters that the reverse deliveries of any gas supplied via the four pipelines delivering Russian gas to Slovakia is impossible, as this would be in violation of the country’s contract terms with Gazprom. Moreover, according to him, this position has been approved by the European Commission, and in order to begin the reversing of flows, it would be necessary to first upgrade the transport infrastructure. The solution would be to build a new pipeline to supply a real reversal. Eustream is ready to invest in the construction of a pipeline for the technical reversing of gas to Ukraine, but this would cost up to 20 million euros ($27.5 million), and the Ukrainian side does not currently have this kind of money. The Slovak side is ready to pay for the work, but only if Ukraine guarantees to take delivery of such gas. Moreover, the main risk that European companies face is that Ukraine will not have any money to pay for reversed delivery. As of April 3, Naftogaz had a $2.2 billion debt for natural gas already delivered, according to Gazprom.